The actor: Cary Elwes first made it big as The Man In Black/Westley the farmboy in Rob Reiner’s fairy-tale classic The Princess Bride. He probably could have set up shop for life as a romantic hero thanks to that movie’s legendary status. But the adventurous Elwes took a different path, landing in offbeat projects from satire (Robin Hood: Men In Tights) to horror (Saw). He recently returned to a different kind of small screen as the eccentric heir Arthur Davenport in Crackle’s first hourlong streaming drama. The much-better-than-it-sounds The Art Of More offers an inside, scandalous look at exclusive New York auction houses. Elwes also just signed up for a new pilot from Lena Dunham. In all his down time, he released a memoir last year about his adventures on The Princess Bride set, appropriately called As You Wish: Inconceivable Tales From The Making Of The Princess Bride. 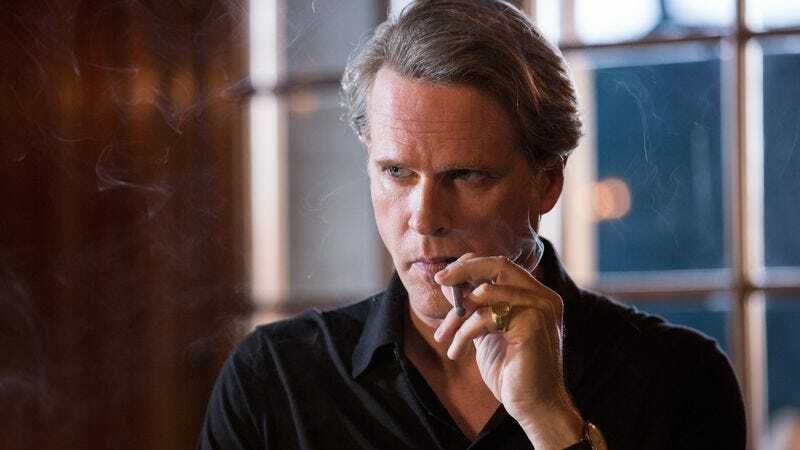 Cary Elwes recently stole a few moments from his latest press tour to briefly revisit a few highlights from his lengthy career with The A.V. Club. The A.V. Club: Congratulations on the new series; it’s really addictive. What about the project appealed to you? You’re practically unrecognizable in it. Cary Elwes: Oh, thank you. Well, the character was just very nuanced. I enjoyed playing him. He was very delicious to play. Put it that way. AVC: And he has some sweet digs to hang out in. CE: Yeah. He’s a fun character. AVC: And it seems from your Twitter feed, you and the cast have been traveling a bit? CE: Yeah, we went to Cannes to show the film to foreign exhibitors, which was a lot of fun. AVC: There are a lot of veterans in that cast. Are those people that you’ve come across before? Did you and Dennis Quaid ever cross paths previously? CE: We’d met, we’d all met socially, but we’d never worked together before. So that was a nice thing to happen, to work with folks that you like. AVC: Your memoir As You Wish indicates that you actually love this movie as much as the rest of the world does. CE: Well yes, I enjoyed making it a great deal. And I thought the film turned out very well. AVC: And you mention that while you were filming it, you guys could tell that this was going to be something really special. CE: Well like I said, we had a really good time making it. And that doesn’t always translate into a successful picture, but when it does, it makes it special. AVC: Even though you have a whole book full of them, is there a specific story that sticks out? We just did this same kind of interview with Carol Kane, and she talked about how Billy Crystal was improvising during their scene together and she felt really bad for you because you were supposed to be dead and it was really hard not to laugh. CE: It was very hard. Very hard. He was deliberately doing medieval Yiddish stand-up. I think he knew exactly what he was doing as far as trying to get me to crack. He got Rob to crack, he got Mandy to crack, he got Carol… He got everybody to crack. The only person who didn’t crack was Andre, because I don’t know that Andre could understand what he was saying. But Andre was still smiling, you know? It was great. It was hilarious. AVC: From there, your career took such an interesting turn. You could’ve just been the romantic hero, but then you did all these other really interesting things. What was it like working with Mel Brooks on Robin Hood? CE: Mel is a delightful person and a wonderful director, and a total joy to work with, as I’m sure you can imagine. And to get a call from him to go to work with him was one of the highlights of my career. CE: Oh, I could write a whole book about that. He’s a delightful guy. He really is. And he loves making movies, you can tell. It was another film where we had a lot of fun making it and it translated into something very positive. We were just kidding around a lot, you know, there was a lot of fooling around. A lot of laughter. I can barely remember a day without laughter. AVC: Another movie with a lot of laughter was the Jim Carrey movie, Liar Liar. Again, you’re kind of chameleon-like as the bland guy who doesn’t get the girl. CE: Right. Right. The wannabe stepfather. Yeah, that role came about really by pure chance. I was talking to Jim Carrey about what he was doing next, and he happened to be talking to Tom Shadyac, the director, and they discussed that I might be right for that role with each other and so it just kind of fell into place for me. And Jim was just so brilliant in that part. AVC: Did he improvise a lot? CE: Oh, my gosh. That scene where he beats himself up in the bathroom? CE: He actually—you can hear it—his head hit the concrete stage floor. They left the sound on the soundtrack. We all jumped up and were worried for him, but he was fine. He went right into another take. Yes. Every Halloween involves somebody showing me a leg or a limb to sign. I’m constantly having limbs thrown at me, thrown in my direction. Not thrown, but, you know, people just approaching me with body parts. AVC: So what is that kind of shoot like? How do you keep up that kind of intensity? CE: We only had 18 days to make it, so it was intense in that we really didn’t have much time to fool around. We really just had to get it done. We had to get down to business. We were shooting about 12 to 15 pages of dialogue a day. AVC: And that was that another kind of surprise hit: Did you have any idea that it was going to take off, with numerous sequels? CE: Not at all. We were as surprised as anyone that Saw turned out the way it did. AVC: You had a segue in the ’80s, ’90s—where you played a string of villainous characters. On Days Of Thunder, you’re screaming in an American accent as Tom Cruise is coming after you in a racecar. Did you guys actually get to drive in those or was that a simulation? CE: Oh, no. It was long before CGI. We were actually trained by Dale Earnhardt and Kyle Petty, so it was a wonderful school. It was fun to learn and definitely a skill that I never anticipated ever learning. Yeah. It was enormous fun. Enormous fun. AVC: Similar to your role in Days Of Thunder was the corporate shill you played in Twister. Talk about CGI, as you weren’t actually getting chased by tornadoes as you were driving around? CE: Well, no. I did end up getting to chase one as part of my research, which I don’t recommend. Unless you’re with professionals, I don’t recommend it. I happened to be on the phone with our resident meteorologist who was also our technical advisor on the film. He was guiding me with his laptop to the storm, and let me put it this way: We came upon the tornado a lot sooner than we thought. [Laughs.] And those things are impressive, and certainly must be respected. So anyone thinking of going out chasing during a storm, I recommend only if you’re a professional do you attempt something like that, because they are as dangerous as they appear. We got out of Pretty Prairie pretty quickly after that!